On 20 March 2012 at 1:14 a.m. EDT the Sun crossed directly above the equator marking the vernal equinox and the arrival of spring in the northern hemisphere, since then ocean surface waters north of the equator have began to warm a bit more rapidly starting to create one of the conditions favorable for cyclogenesis: the generation of tropical cyclones. By observing weather patterns over the ocean in the northern hemisphere it is clear that the several basins where cyclogenesis typically takes place have been rather quiet so far in 2012 except for a tropical storm PAKHAR, which developed in the South China Sea before making landfall in south Vietnam near Ho Chi Minh City at the end of March. While this quietness in terms of cyclonic activity during the early part of the calendar year is not unexpected in the northern hemisphere oceans, changing weather patterns are already clearly under way as the change in seasons takes hold in response to the continuous shift in the angle of the Earth’s axis with respect to the solar plane.One rather important such changes is the decline of the La Nina event that prevailed near the west coast of Peru and Ecuador in 2011, which is a known contributor to cyclogenesis in the northern tropical Atlantic. What will these changing weather conditions bring in terms of tropical cyclone activity in the northern hemisphere worldwide? What is the significance of the below average number of total tropical cyclones over the past two years? How will the many factors that contribute to cyclogenesis on the several oceanic basins combine, to produce what kinds of hurricane seasons around the world? Of interest to those residing in the coastal regions of Mexico and the USA along the Gulf of Mexico, Florida and the Atlantic, what can we expect from the 2012 Atlantic hurricane season? Will the disappearing La Nina and/or the now prevalent cooler than average North Atlantic Oscillation contribute to an above-average or a below-average Atlantic hurricane season in 2012? Relative to what is happening with La Nina [ENSO] and sea surface temperatures, both important contributors to tropical cyclone activity in the Atlantic take a look at the two images that follow, which depict changes in the temperatures of surface waters on a wide expanse of oceans from the eastern Pacific to the Atlantic over a period of ninety days earlier this year of 2012. Pay attention to the rather elongated swath of cooler waters emerging from the Pacific coast of Peru and reaching more than 6,000 km to the west. 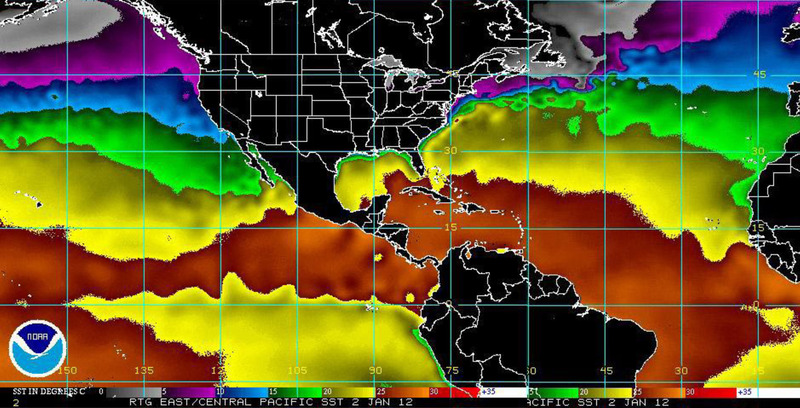 marking the La Nina event, on the image from 2 January 2012; this La Nina signature has disappeared and has been replaced by much warmer surface waters on the second image from 31 March 2012. Notice also how large region of cooler surface waters in the Gulf of Mexico and portions of the Atlantic near the coast of equatorial Africa seen in the 2 January image, have been replaced with warmer waters in the 31 March image. Also of notice in this comparison between the two images is the north-central Atlantic region where cooler surface waters still maintain a hold as of 31 March 2012, which is a sign of a cooler than normal North Atlantic Oscillation, another factor that influences tropical cyclone development over the Atlantic. There are several features of interest on the image above: (a) ‘Hurricane alley’ is empty and free of disturbed weather cells or the storms that usually become commonplace later on during the year; (b) However, some stormy weather cells or tropical waves are already seen bordering the southern limit of ‘hurricane alley’. Soon such tropical waves, which form over equatorial Africa, will line-up and move west to populate ‘hurricane alley’ and become seeds for possible tropical cyclone activity; (c) There are two large cells of rain and storms over the northwestern region of South America and over off-shore waters in the Pacific near Central America. This weather pattern has been prevalent over these regions for the past two years, and have been the source of copious precipitation over Central America, causing repeated flooding; (d) There is a region of storms and disturbed weather over the southwestern Gulf of Mexico, in the Bay of Campeche a sub-basin known for generating tropical cyclones in the past. All in all there are familiar patterns already in place over these basins; we’ll just have to see how these evolve as surface waters become warmer and the atmosphere responds in kind in coming weeks. Elsewhere in the world there is plenty of disturbed weather and storms in the southern regions of the Indian Ocean between Madagascar and the east African coast and western Australia, in a pattern that is gradually shifting northward toward the equatorial regions where westward pulses will feed into the ‘tropical wave assembly line’ over Africa, which will in turn feed into ‘hurricane alley’ over the Atlantic. These features can be seen in the image below. Above image also shows the remnants of tropical storm Pakhar over the southern regions of Viet Nam and Cambodia where it made landfall on 30 March. 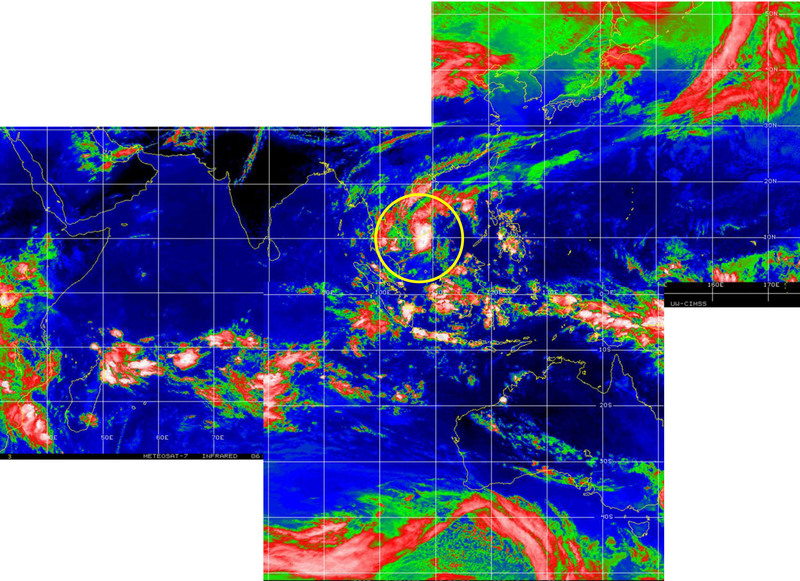 Also visible is an area of storms and rain over and near the Philippines, which typically prevails over that region during the northern hemisphere’s summer. 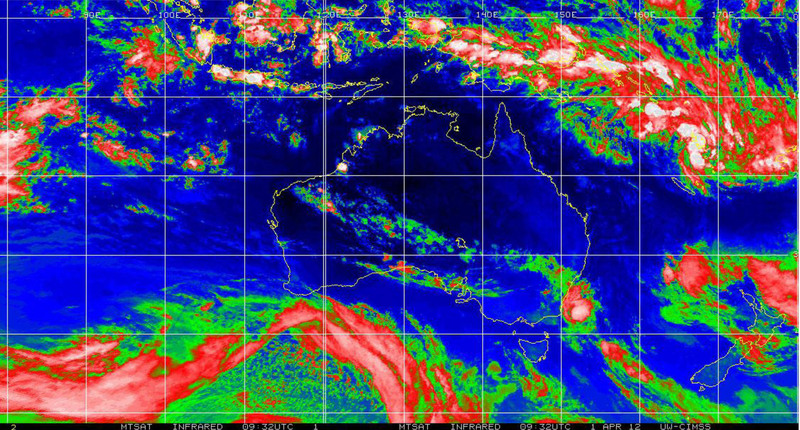 Rounding-up the worldwide imagery of the atmosphere over various basins, the image below shows Australia and its surroundings waters where several tropical cyclones developed earlier this year during the southern hemisphere summer. As Mother Nature assembles these patches of colors, reflective of sea surface water and atmospheric conditions, the question is: what does it all mean? What kinds of tropical cyclone seasons will there be in the Northwestern Pacific, or in the Northern Indian Ocean, what about the Central Pacific, the Eastern Pacific and the Atlantic hurricane seasons? 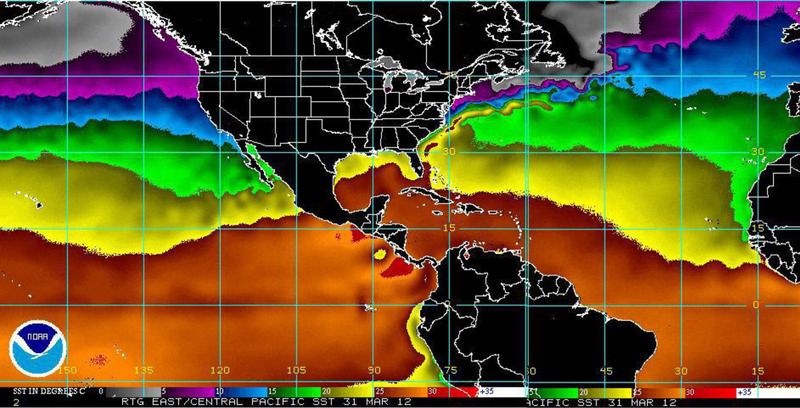 In this regard it is interesting to note that the group out of Colorado State University for the first time refrained from issuing a prediction last December 2011 relative to the kind of hurricane season that 2012 will bring over the Atlantic basin, although they have indicated a forecast will be issued in April of 2012. NOAA’s National Hurricane Center has also refrained from issuing a seasonal prediction for the Atlantic in 2012. There are however a couple of predictions that have been issued for the 2012 Atlantic hurricane season, one by Tropical Storm Risk [TSR] a group out of University College London specializing in risk management and insurance, which has called for a more active than average season for the Atlantic with 14.1 tropical storms [plus or minus 4.2], 6.7 hurricanes [plus or minus 3.0] and 3.3 major hurricanes [plus or minus 1.6], and the other by Weather Services International [WSI] which calls for a “near average” 2012 season in the Atlantic with a total of 12 named storms consisting of 7 hurricanes and 3 major hurricanes. It is interesting to see that TSR’s prediction carries quite large margins of uncertainty. relative to this we will have to wait to see how they pan out. In my opinion, these advanced predictions of annual tropical cyclone activity for a given basin have little to no practical use given the uncertainties about actual landfall events, about possible time-lines and intensities. The reality of our vulnerability to tropical cyclone impacts originating in the Atlantic, or in any other basin for that matter, is that the only certainties we have are: (a) there will be an annual season; (b) all hurricane impacts are sources of potential damage, and (c) it only takes one hit by a land-falling hurricane to cause damage and human suffering, regardless of how many tropical cyclones there may be in a given year over a given basin. In view of this reality the only prudent course of action is to be prepared! To pay attention and heed the warnings! And to practice mitigation!